Ideal for ultra-slim smartphones, tablet PCs, mobile WiFi devices, GSM/UMTS modems, and WLAN cards, micro-SIM card sockets come in a range of hinged, push-pull and push-push styles for optimum space and cost-savings. 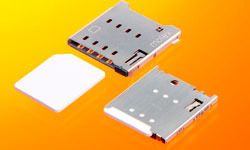 Push-Pull style micro-SIM card sockets combine best-in-class features including the lowest (1.18mm) profile height with unique card-detect-and-activation mechanism. Other push-pull socket variants include a miniature footprint with high, normal force delivering robust terminal-to-card connectivity and high electrical reliability, proprietary socket-damage-prevention designs, anti-short capabilities, detect switch and wide finger areas for easy card insertion and removal. Designed for tight- spaced, top-loading style applications as well as mid-board layouts that preclude the use of front- or side-entry style sockets, hinged style sockets are highly compact and allow partial tilt or full opening of lid to allow for unobstructed placement or removal of SIM cards. A range of Push-Push sockets are available for applications requiring card ejection from the side of a portable mobile device. Molex offers two styles, both with superior contact force: a 1.42mm six-circuit and a 1.60mm eight-circuit solution. Molex is a leading one-source supplier of interconnect products. Our team of highly skilled experts is focused on the design, development and distribution of innovative product solutions that touch virtually every walk of life. Our portfolio is among the world''s most extensive, with over 100,000 reliable products, including everything from electronic, electrical and fiber optic interconnects to switches and application tooling. We leverage extensive worldwide resources to meet customer needs on a local, regional and global level. Molex offers well-established sales, product development, manufacturing and logistics resources in Asia, Europe and the Americas. Our engineering, development and manufacturing capabilities are organized into three product divisions, all serviced by the Molex Global Sales and Marketing Division. Commercial Products Division: Develops and manufactures multi-market products for a diverse range of applications. The divisions new product activities are focused into two main areas: high-speed, high-density, high-signal-integrity interconnect applications; and interconnect solutions for advanced engine, cockpit and infotainment functions in automobiles and other transportation equipment. Micro Products Division: Known for developing the smallest connectors in the world, the Micro Products division is focused on portable digital product applications. This division has a number of business units. Among these is Molex Kiire, the business unit created to accommodate the 2008 acquisition of Fuchigami Micro. Fuchigami Micro was known in advanced technical circles for solving unique problems with custom electromechanical components of the smallest size. The business unit''s capabilities including photolithography, micro-etch and small scale thermal dissipation technology. Integrated Products Division: Produces higher-level assemblies utilizing Molex interconnect technologies, typically in printed circuit board, fiber optic, flex circuit and other applications. Its business units span a wide variety of applications. The Automation and Electronic Products Group specializes in harsh-environment technology for factory automation, power, temporary lighting and ergonomic products in industrial, construction and other applications. The Premise Network Group focuses on structured cabling for office buildings, universities and government campuses. Global Sales and Marketing Division: A highly collaborative team of regional sales and industry marketing professionals who work to provide a higher level of service to Molex customers. A significant number of customers use products from more than one of our divisions. Many also work on a global scale, designing in one location and manufacturing in another, so customer service requires a high degree of internal coordination. Our sales team is supported by a global IT infrastructure that helps them exchange and track customer information.